The transfer of seven critically endangered kakapo to Little Barrier Island is a significant move to help secure the species’ survival, Conservation Minister Kate Wilkinson says. The native parrots were captured on the predator-free Whenua Hou/Codfish Island and Anchor Island in Southland then airlifted – by helicopter and Air New Zealand passenger flights - to their new home north of Auckland yesterday. Though the birds will be monitored by the Department of Conservation on Hauturu/Little Barrier Island, they will be free to breed and raise their chicks without the high level of support they currently receive. “This is an epic journey by these flightless birds. They have been flown almost the length of the country in one day to a new home,” Ms Wilkinson says. 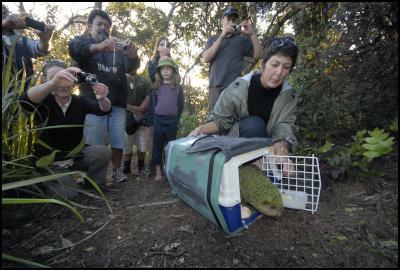 “The kakapo have been released on Little Barrier Island to see if they can successfully raise their chicks without aid. Their progress will be closely monitored and support will be provided if it’s required to keep the birds alive. “There are only 126 kakapo left in the world and we need to see if they can survive and flourish without outside help. This initiative could play a major role in securing the long term survival of the species. Kakapo lived on Hauturu/Little Barrier Island between 1982 and 1999, when they were moved so the island could be cleared of rats. It is expected to take up to 10 years to determine if the kakapo can bring up their chicks without assistance. The work is part of the Kakapo Recovery Programme, a joint initiative between the Department of Conservation, New Zealand Aluminium Smelters and Forest & Bird that dates from 1990. “This is DOC’s longest-running conservation partnership and it’s been a great success. Since it was formed kakapo numbers have more than doubled. The kakapo or ‘night parrot’ is unique to New Zealand and was pushed toward extinction by human colonisation and the introduction of predators such as rats, stoats and possums. By 1995 only 50 kakapo were known to exist. Today there are 126 kakapo being managed by DOC on Whenua Hou/Codfish Island, near Stewart Island, and Anchor Island, in Fiordland. The Kakapo Recovery Programme includes running breeding programmes, maintaining predator-proof sanctuaries and strengthening the wild kakapo population. It combines the efforts of scientists, rangers and volunteers. This work includes intensive monitoring of kakapo, regular health checks, predator control, supplementary feeding, artificial incubation and hand-rearing, research (ground breaking artificial insemination in birds, genetic studies, and supplementary feeding trials), and developing technology. Eight kakapo were captured on Whenua Hou/Codfish Island and Anchor Island yesterday. One of the birds was found to have a minor injury and was taken to Auckland Zoo as a precaution. Study Abroad India with the best-in-class edu tour operators in India. SAPI Asia has now conducted 157 tours and along the way it has educated more than 1000 expatriates the classical courses Indian courses in Ayurveda, Yoga and other Service Learning Modules. Get in touch with us today to explore the myriad facets on Indian cultures. All the students dreaming to Study in the USA are cordially invited along with your parents and friends to attend the USA Admission Day on 15th June 2018. This Education fair is a wonderful chance to meet Representatives of the Reputed USA Universities for the upcoming intakes.